What a find! Perfect place to sit and knit while looking out at God's creations! I also buy quilts, love them when they are already broke-in:) Charlie was keeping an eye on you to make sure you got it all right! Enjoy your evening, HUGS! How nice to have a sacred space in your bedroom. It is really important to have a place to relax and knit and look out the window and snuggle with your kitty-cat. Glad you got a good bargin on the chair and quilt. I know you love quilts! Oh Stacy, what a beautiful quilt. 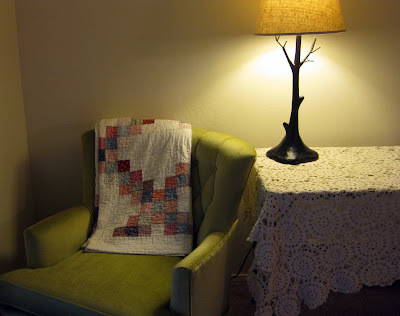 I think quilts make a room feel more "homey" and the knitting is just completes everything. Your Charlie looks so sweet. Have a great night. Looks cozy! Love finding the right piece at the thrift stores. Rec'd the ATC today...Love it! That looks like a lovely knitting niche. I'd like to come over and plop down in your chair! Great find!! I love that chair! And you made yourself a very nice little nook. Love it. Love, love, love the chair and its colour. Good find! Best enjoyed with cat near you, for sure! Wow -- beautiful finds! It looks like the perfect space to relax and enjoy! I'm so envious of you- that chair is wonderful! So glad you had the perfect place for it! 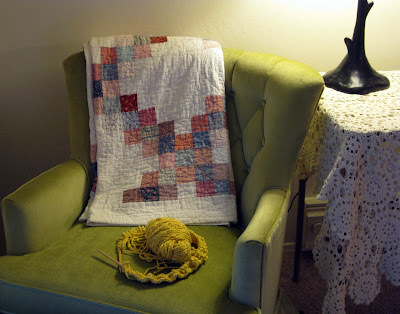 Love the chair and...OMG I LOVE the quilt. I wish I could take beautiful photos like you!!!! No words are needed they say it all. Oh how I envy that chair! I adore the lamp as well. Happy knitting. 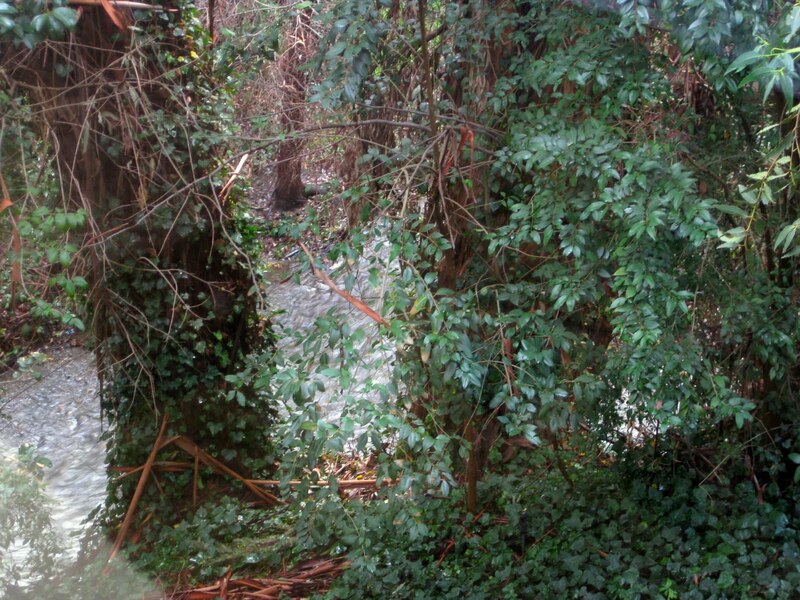 It looks like a wonderful spot to relax with Charlie and your knitting. Enjoy!! 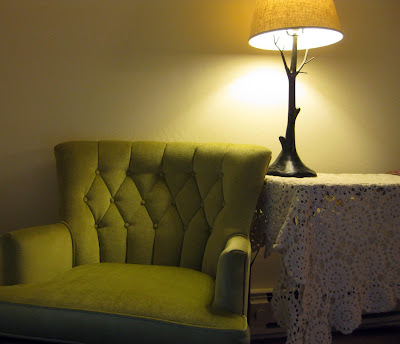 Looks 'just right' and comfy in your sacred corner. And even better to find chair and quilt for such a great deal! I love it when that happens, too.